Moving, remodeling, staging, or just in need of some extra living room? Call to reserve your New Haven storage space today. Get the extra space you need at a great rate, and no credit card required. You care about cost and convenience. That is why storing your items with us is a smart move. Try full-service storage! You'll be glad you did. This option provides convenient and is more affordable than renting a self-storage unit. Compare offers and start renting today. The most notable difference in self vs. full-service storage is that with full-service storage, we do all the lifting and moving for you. Our storage services New Haven, CT provide movers to pick up your storage items and to store them safely in our storage facility for you. Lastly, when you need them again, they deliver them back to you. When searching for self-storage facilities many people search for a nearby location. Thinking they will want to pick-up and drop-off items often. However, this is not often the case. Most people don't need to have access to their items 24 hours a day. So, why pay more for a service you don't need? How do I access my storage items? When you want access to your stored belongings, simply call the office and set up an appointment with our warehouse manager. He will arrange for you to have access to the facility and to view all of your storage items. There is a fee associated with the appointment. Full-Service storage frees up your time and energy for other exciting things. All you need to do is schedule the pickup or a viewing appointment with the warehouse manager. We take care of the rest. Think of it as a New Haven storage valet service. Try our moving storage solution. It combines the move out from your current location, and the delivery to your storage unit into one easy option. Plus, you can add on new haven packing services too. If you are not moving and only need to store a few items, our movers pick up your things and deliver them to the storage unit for you. Then, when you need your things, we deliver them right to your doorstep. No matter how many items or how few items you have to store, we have an affordable solution for you. We offer auto-pay options to help you never miss a payment and to keep track of your storage rental. In addition, you can use our website to secure your storage unit now! Moving is stressful enough without worrying about whether or not all of your things will be safe while in storage. 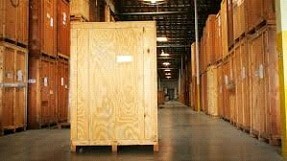 Our storage and warehousing facility maintains bright, clean, safe and secure storage units in New Haven. With Collegian Movers you are not locked into a long-term or a large space warehouse rental contract. As a result, you can downsize or upsize your space at any time. Collegian Movers carries a full line of moving and storage supplies such as boxes, packing tape, packing materials, and more! Our supplies help move large and oversized items like wardrobes and big screen TVs and keep delicate items like dishes and pictures safe during moving and storage. Stop in our office before you move for your supplies! For helpful moving and packing tips, or for a list of our moving supplies visit our guide here. The storage unit is professionally loaded, so more fits in it. Furniture is protected with pad and shrink-wrapping. Only authorized personnel are permitted into the warehouse, for increased security. Access to your items is limited to the company’s hours of operation. Not a great solution if consistent access is required. Our New Haven furniture storage facility is a convenient collection and storage center to use for temporary storage. Storage is most helpful while staging a home for sale, during a renovation, or a remodel. We receive and inspect all deliveries for damage. In addition, we consolidate and store the items until they are ready for delivery from our New Haven, CT storage facility. Logistic Managers often take advantage of our comprehensive warehouse and moving services. Our team acts as a seamless extension of their business. We ensure that furniture, fixtures, and equipment are received, handled, shipped, and delivered safely, reliably and on-time to your chosen location. Please contact us today for all of your New Haven CT moving and storage needs. Get a Free Moving Storage Quote. You can trust Collegian Movers for a faster, more efficient, and cost-effective storage solution. We've worked hard to establish our proven reputation with renters, home buyers and sellers alike and we stand by our promise to deliver premium storage services. As experts, we are in the business of protecting and storing your prized possessions, furniture, and belongings. Our company has helped families and businesses with their storage needs since 1989.